We’d love your help. Let us know what’s wrong with this preview of Ship of Souls by Zetta Elliott. To ask other readers questions about Ship of Souls, please sign up. This is not what I was expecting. I wish the fantasy elements were developed more. Also did it really need to have a love triangle why couldn't they be just a group of friends? I liked the bit of history we got. I didn’t like reading the racial slurs at all, it really bugged me and cost the book a star. Overall it wasn't a book for me. Set in New York, we meet D as he becomes adrift in the foster system, full of the pain of recent loss, his situation made doubly hard by his awareness that he has to be the best version of himself to avoid the possibility of being sent to a group home. Without the luxury of dealing with his pain, he has numbed himself, untrusting of connections, keeping his head down to survive. D's lack of ties to anyone means he's a suitable host to Nuru, a being from 'another world' who wishes to rescue trapp Set in New York, we meet D as he becomes adrift in the foster system, full of the pain of recent loss, his situation made doubly hard by his awareness that he has to be the best version of himself to avoid the possibility of being sent to a group home. Without the luxury of dealing with his pain, he has numbed himself, untrusting of connections, keeping his head down to survive. D's lack of ties to anyone means he's a suitable host to Nuru, a being from 'another world' who wishes to rescue trapped souls. This was a well-intentioned novel with a decently evocative sense of place that I found unfortunately too heavy-handed to be enjoyable to read. The three main characters are the sort I wish there were more of in fantasy -- non-white characters who are centered in the narrative and who are clearly shaped by their race but not entirely defined by it. Unfortunately, they are never given the room to come to life. We are given the information encapsulated in the jacket description, and one or two offh This was a well-intentioned novel with a decently evocative sense of place that I found unfortunately too heavy-handed to be enjoyable to read. The three main characters are the sort I wish there were more of in fantasy -- non-white characters who are centered in the narrative and who are clearly shaped by their race but not entirely defined by it. Unfortunately, they are never given the room to come to life. We are given the information encapsulated in the jacket description, and one or two offhand statements that begin the process of humanizing those descriptions (D giving up on dreams of college because his foster mother is unlikely to pay for it; Hakeem trying to figure out how to integrate his faith into his day-to-day life; Nyla's alternately manipulative and supportive relationship with her stepmother), but then the entire rest of the novel is spent developing one of the clunkiest love triangles I have ever had the displeasure of reading. "It's a long story, and I don't have the strength to tell it all tonight. I can, however, share some of my history." "You have endured much for one so young." "You should rest now. You'll need your strength for the task we must undertake." "When it is time, all will be revealed." Just absolutely the worst sort of not at all informative, vaguely mystical claptrap that always seems to come out of the mouths of poorly realized magical mentors in programs aimed at five year olds. The dialogue was so trite, in fact, that I was kind of hoping that the bird would turn out to be evil, manipulating the vulnerable, newly orphaned and unsure D with the things little kids want to hear. But, unfortunately, the bird was played entirely straight. Lovely characterizations and a touching, unusual plot. I would love to read an expanded version of this, so we could linger in situations and exchanges a little longer, but even happening as fast as it does, the story gives us a great sense of D, Nyla, Keem, Nuru, and Billy. D became a ward of the state, when his mother died from cancer. Lucky for D, he is taken in by Mrs. Ward, a nice white lady. Things are going great for D until Mrs. Ward cares for Mercy, a crack baby. Soon, all of Mrs. Ward’s time is occupied by Mercy. D is a math whiz. This is why Mr. Powell hires D to tutor his son, Hakeem in math. Nyla has captured the attention of both D and Hakeem. Soon, D, Hakeem and Nyla are hanging out together. D decides one day to go to the park. Once in the park, D he D became a ward of the state, when his mother died from cancer. Lucky for D, he is taken in by Mrs. Ward, a nice white lady. Things are going great for D until Mrs. Ward cares for Mercy, a crack baby. Soon, all of Mrs. Ward’s time is occupied by Mercy. D decides one day to go to the park. Once in the park, D hears a voice. The voice is coming from a small, white bird. The bird’s name is Nuru. D. takes Nuru home with him. Nuru tells D that she must return and help the lost souls. D agrees to help Nuru on her mission. He is joined by Hakeem and Nyla. It will be a dangerous mission as they battle the Nether beings. I thought this was an entertaining, quick read. In fact, I sat down to read this book and didn’t put it down until I had finished it. D and Nyla I felt were the strongest characters. This book is classified as a young adult read and I would say that it is appropriate for this audience. There was nothing too scary about the nether beings. What I did like the most about this book was that D, Nyla and Hakeem were misfits and the most unlikely of people to group together but in this book it worked. I hope to see these three again in the future. Dmitri (aka D) is intelligent, an overachiever, a math whiz. The only family he had was his mother, until he lost her to cancer. Now D is in foster care. His foster mother, Mrs. Martin, is like a grandmother to him and it doesn’t bother him that she’s white. But then she gets another foster child and that does bother D; he’s left feeling like he matters to no one. Until a talking bird named Nuru comes into his life. Nuru is on a mission and she needs D’s help. Zetta Elliott has a good imagination Dmitri (aka D) is intelligent, an overachiever, a math whiz. The only family he had was his mother, until he lost her to cancer. Now D is in foster care. His foster mother, Mrs. Martin, is like a grandmother to him and it doesn’t bother him that she’s white. But then she gets another foster child and that does bother D; he’s left feeling like he matters to no one. Until a talking bird named Nuru comes into his life. Nuru is on a mission and she needs D’s help. Zetta Elliott has a good imagination and she writes well. I had no problem visualizing everything that was going on once the fantasy part began, but I felt some scenes should have been more intense – what was going on with the stone beast, for instance – and the young people should have reacted differently at certain times. Even though this story is fantasy, it can still be realistic in its portrayal of characters. I liked the words of wisdom D’s mom had shared with him. I wasn't clear on why he never had a relationship with his dad, but it would have been nice to know. I liked D and his friends, Keem and Nyla. I liked the bit of history. I didn’t like reading the racial slurs. Ship of Souls wasn’t as adventurous as I expected it to be. It was an interesting read and I really felt for D in the end. Ship of Souls by Zetta Elliott beckons readers to continue turning pages to learn what will become of Dmitri, or “D”, who is left without his close family and merely beginning to form new friendships with distinct character as his school, when a talking bird convinces D to take it home and assist it in an unbelievable mission. At first skeptical, D’s new friends Hakeem and Nyla soon support D’s strange journey to assist the bird with glowing eyes and a voice of its own. This book would best suit Ship of Souls by Zetta Elliott beckons readers to continue turning pages to learn what will become of Dmitri, or “D”, who is left without his close family and merely beginning to form new friendships with distinct character as his school, when a talking bird convinces D to take it home and assist it in an unbelievable mission. At first skeptical, D’s new friends Hakeem and Nyla soon support D’s strange journey to assist the bird with glowing eyes and a voice of its own. This book would best suit middle and high school-aged readers, while also relevant to advanced younger readers. The language, vocabulary, and pacing offer accessibility for young readers who may still be building confidence in their reading skills. The protagonist, D is eleven years old when he becomes a foster child. Reflective of the author’s intentions to create more narratives that serve as “mirrors” for African-American young adult readers, this book spotlights Afro-centric characters and details of their cultural backgrounds. For example, when D applies his math skills to tutor an older student for income as well as companionship, readers learn about Hakeem’s interest in basketball as well as his Muslim upbringing. This book offers fantastical portrayals of of soldiers that died in the Revolutionary War—including enslaved black soldiers who fought alongside Americans as well as the British who promised their freedom—who continue to haunt as a response to unrecognized violence and injustice. The setting of today’s African Burial Ground National Monument offers an opportunity to discuss challenging topics alongside young readers. It may pose challenges as a “window” for students unfamiliar with the foster care system, though this can be a useful resources to build students’ empathy towards children who have lost one or both parents and needed to form new relationships with caretakers and foster parents. For example, D’s actions are influenced by his wanting to please his white foster parent so that he does not need to return to the halfway house. Another potential concern of adults may be the blend of realistic, historical, and fantastical elements; yet, Elliott does well to distinguish through tone the more imaginative parts of this narrative that build suspense for readers’ desire to continue learning what will occur. Overall, I recommend this book mostly for its detailed, diverse, and thoughtful characterization that illustrates to readers the qualities of true friendship and support. For educators and guides, Elliott includes Discussion Topics and Writing Activities at the back of the text. These range from complex text themes and topics, including: parental relationships and absent parents; peer relationships, name calling, discrimination based on religion, and creating community and a sense of belonging for one’s self; identifying significant historical sites in the community, the history of slavery in the the Revolutionary War and the founding of America. Elliott also includes writing prompts that both spark imagination and practical writing skills on issues including gendered street harassment. The writing prompts allow room for student choice, for motivation and critical thinking. This adds to an already enthralling read with mature content that challenges students to grapple with real and creative elements of the narrative. I really loved the concept of this book. I felt at times along the way that it could have been executed better. The fantasy elements felt rushed at the end to me. But this was my first Zetta Elliott work to pick up and I am looking forward to reading more. Certainly unlike any other book of its kind, Ship of Souls is loosely plotted but deeply felt, with an urgent internal logic to its telling, like a fable or a myth, but grounded in many small everyday Brooklyn realities. So much love and light in this book! I read it all in one sitting. I couldn’t wait to see where D would end up, in the light or in the dark. Wonderful Ending! I enjoyed this book, the concept behind the book is brilliant! However I do think it could have been longer as everything was very rushed. Elliott, Z. (2012). Ship of souls. Las Vegas, NV: Amazon Publishing. 124 pp. ISBN: 978-1-6121-8268-1. (Paperback); $9.95. Zetta Elliott lives in Brooklyn. On a recent trip to New York City, I walked through Prospect Park with Elliott. She pointed out two Revolutionary War marker stones that helped urge her toward this story. In Central Park, I walked mindful of this history. Elliott teaches ethnic studies and has her PhD in American Studies (with a focus on depictions of racial violence in Africa Elliott, Z. (2012). Ship of souls. Las Vegas, NV: Amazon Publishing. 124 pp. ISBN: 978-1-6121-8268-1. (Paperback); $9.95. Zetta Elliott lives in Brooklyn. On a recent trip to New York City, I walked through Prospect Park with Elliott. She pointed out two Revolutionary War marker stones that helped urge her toward this story. In Central Park, I walked mindful of this history. Elliott teaches ethnic studies and has her PhD in American Studies (with a focus on depictions of racial violence in African American literature). Ship of Souls is based on her careful research of the African Burial Ground and the lives of African-Americans in her neighborhood during the Revolutionary War time period. Dmitri or D, as he is called, doesn’t have it easy. His mother has died from cancer. He is shuffling between his foster home and a new school. Just when he thinks he might make it in Mrs. Martin’s foster home, she takes in a baby addicted to crack. D cannot compete with the needs of this small child. He passes the time watching birds in the park. At school D has no time to dwell on his own troubles because he has been offered a job tutoring Hakeem (Keem), a basketball player who defies any stereotypes by his very unusual lineage. And there is Nyla, a young woman he has been watching with great interest. Nyla invites D to sit with her at lunchtime. It looks like Keem, who is “built like a giant, and kids at school worship the ground you walk on!” (p. 22) has his sights set on Nyla too. The three of them settle into something resembling a friendship. When D rescues an injured bird from the park, his life changes. This bird shifts shapes and seems to expect something from D. It even speaks! When D shares the story of this bird, Nuru, with Nyla and Keem, readers can almost hear the eerie music. Sharing this hard to believe secret proves to be a main factor in establishing the trust necessary for the friendship between the three to flourish. Nuru, leads D, Nyla, and Keem along the paths trod by soldiers during the Revolutionary War. These ghosts seem to feed on pain. Monsters rear their ugly heads. Danger lurks. Elliott introduces to readers firmly grounded history mixed with creepy, graveyard language that will appeal to young readers. Students may argue whether Nyla should like Keem or D, but they will also pick up facts about the Revolutionary War. They will see that New York was a battleground during this war. They will absorb the fact that African-Americans fought and died during the Revolutionary War… Many readers are unaware that Broadway, very close to ground zero, has the bones of African-American soldiers just below its sidewalks and asphalt. This is a book filled with significance and I haven't even mentioned that Elliott peppers her novel with comparisons to 9/11 and the racism with which modern day New York City Muslim students face on a daily basis. I appreciate books that use very real history, in context, to tell a story that will grip young readers. When that book is also likely to spark an awareness of cultural differences and an interest in history and how it impacts current events, so much the better. Purchase this one for middle school libraries and point it out to the history teachers. By the time this review is printed and distributed, you should find a video interview with Dr. Elliott talking about this book and other topics on my website (http://www.spicyreads.org/Author_Vide...). After 11 yr old Dmitri, who goes by D loses his mother to cancer, he's placed in foster care and goes to live with Mrs. Martin. Just happy to have a place to live, D is on his best behavior. D's only indulgence is bird watching in the park and he keeps to himself at school. D's status as a loner is challenged after he finds himself hanging out by chance with two of the popular kids, Hakeem and Nyla. D's life changes forever after coming to the aid of a Bird that is anything but, its a being that After 11 yr old Dmitri, who goes by D loses his mother to cancer, he's placed in foster care and goes to live with Mrs. Martin. Just happy to have a place to live, D is on his best behavior. D's only indulgence is bird watching in the park and he keeps to himself at school. D's status as a loner is challenged after he finds himself hanging out by chance with two of the popular kids, Hakeem and Nyla. D's life changes forever after coming to the aid of a Bird that is anything but, its a being that goes by the name Nuru can take on any shape of its choosing. D has been selected has a host to assist Nuru in bringing peace to millions African American souls by providing them with a way to finally pass over. Though the friendship is newly formed Hakeem and Nyla will not let D do this alone. When I finished it the first time I thought it was good. I loved the characters. They made the story for me. One of the things I love about Elliott's writing is she knows how to craft dimensional characters. Even the walk- ons, will leave an impression. Though at times this skill can lead the reader astray. I found myself being wanting to know more about the characters that were meant only to make a quick appearance. A good example of this was the eclectic group of kids that sit at Nyla's lunch table and embrace their freak status. While this is D's story from beginning to end, Elliott still makes room for Hakeem and Nyla, sharing enough about both to paint a clear picture. Much of the appeal for all three characters comes from the fact that they easily come across as real teenagers, with distinct voices. The three had good chemistry together and I would've liked at least another chapter in which they got to know each other better. The guiding spirit that goes by the name Nuru has the task of helping the dead who want to pass over to find eternal peace. Though Nuru has been held captive for 100 of years and unable to help the souls of many African Americans that died around the time of the American Revolution cross over. Nuru elects D has is host to complete this quest. When Nuru first appears I didn't know if D could trust this being or if it was simply using D has a host to accomplish its mission without any concern for his well being. I liked not knowing, it kept me on my toes. The first time in I felt Ship of Souls had a few unexplored threads but there was still a lot to like about it. Beyond the characters its visually amazing. When the kids finally found the room where the African American souls were trapped, Elliott had my heart. She describe sorrow with such beauty. Also Elliott's writing is strong and crisp. There are moments and lines that are hard not to be moved by. The first time in I wished Ship of Souls was longer. However when I read it again I was more okay with the length (though I still wanted an extra chapter in which the three friends get to know each other better) and everything came together better. Everything I enjoyed the first time was still there and I found a few more things to appreciate. Ship of Souls is claffisified as YA but comes across as more MG. Ages 11 up. The chapters are short making this an excellent choice for reluctant readhers. The cover wasn't final until around mid or late Janurary I believe but I think it was well worth the wait. I really like it and believe it has some serious eye appeal. D has been on his own since his mother died of cancer. But being a math geek in New York City and trying to navigate school, a foster home and a ne I like reading in my comfort zone. And my comfort zone usually means strong women in fantasy. However, I also try to stretch myself, to read something that will introduce me to an unfamiliar culture or experience. Zetta Elliot’s Ship of Souls seemed to be the perfect compromise – a fantasy featuring a young black boy, set in (of all places) Brooklyn. Em's Review: D’s mom was his best friend and his only family. When she passes away, he ends up in foster care with a kind elderly woman named Mrs. Martin. Not wanting to be sent back to the group home, D is mindful to always be the best possible version of himself. Like the grandmother he never had, Mrs. Martin cares for D, but lately her attention has been focused on a new addition to the family, a crack-addicted baby that Mrs. Martin has decided to foster. At school, he doesn’t have to worry s Em's Review: D’s mom was his best friend and his only family. When she passes away, he ends up in foster care with a kind elderly woman named Mrs. Martin. Not wanting to be sent back to the group home, D is mindful to always be the best possible version of himself. Like the grandmother he never had, Mrs. Martin cares for D, but lately her attention has been focused on a new addition to the family, a crack-addicted baby that Mrs. Martin has decided to foster. At school, he doesn’t have to worry so much about begin perfect, but he still joins the math club, because the coach asks him and he feels it would be rude to say he’d rather be alone. When star basketball player Hakeem’s dad is looking for a math whiz to tutor his son, D lands the job. D soon finds an ally and friend in Keem and together they attract the attention of Nyla, a beautiful, self-proclaimed freak. One day after school in the park, D comes across a trapped bird. In freeing the creature, he learns that what looks like a bird is actually a being from another realm. Not only that, but he is now the being’s host and there is an important task that he must take on. With his new friends by his side, he will attempt to gather the dead and help them find long overdue freedom. 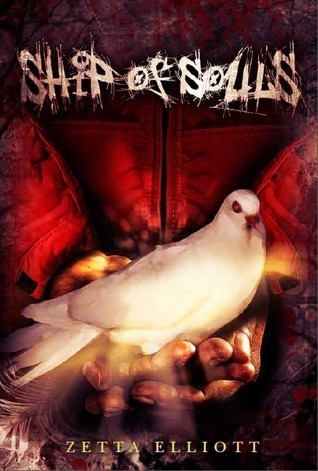 If Zetta Elliott’s Bird and A Wish After Midnight had a baby, it would be Ship of Souls. While Bird‘s Mekhai and D are both unique, they have things in common – their respectful and calm temperaments, their intelligence, their fondness for birds, and their loss of a loved one. With A Wish After Midnight, the magic also begins during a visit to a park/garden in Brooklyn and the magic involves history, though in a much different way. I loved both of these previous Elliott works and I found that the similarities were a welcome connection rather than leaving me with a sense of “been-there, done-that”. In fact, even with familiar aspects, this book feels intensely original. Summary: D’s mother has passed away, leaving him an orphan. Luckily, D is very intelligent from being home schooled as a child, so he is placed into foster care quickly. D and his foster-mother get along very well. He is on his best behavior, and he does enjoy being with her. However, his life changes slightly when a new baby comes into her care. D is left to his own devices a bit more and has more freedom. At school, D offers to help one of the basketball stars, Hakeem, in math at the library. After his initial tutoring session, there is a small kinship formed between the two of them. Then, the popular hot girl, Nyla, asks D to sit with her group at lunch. She finds out that D is interested in birds, so she invites herself along on a bird watching expedition. After such a busy day, D goes to the park on his way home. While there, he finds a bird that has been trapped. He sets her free and finds out that this is no ordinary bird. This bird speaks to him and says that she is from another universe and D is her host. The next day, Hakeem, Nyla, and D go on their bird watching excursion. This seemingly innocent adventure turns perilous when beings from another realm try to capture them and D’s bird. D never really had a lot of friends so the loss of his mother is particularly devastating to him. As the only child of a single mother, there’s little else for him other than the foster care system. D doesn’t know much about the workings of the system, but he knows that nothing in his life will be secure anymore. Elliott does a masterful job of writing this story on so many levels! Where we see how much D has: his quick placement in a caring home, a good school with teachers who care about him a D never really had a lot of friends so the loss of his mother is particularly devastating to him. As the only child of a single mother, there’s little else for him other than the foster care system. D doesn’t know much about the workings of the system, but he knows that nothing in his life will be secure anymore. Elliott does a masterful job of writing this story on so many levels! Where we see how much D has: his quick placement in a caring home, a good school with teachers who care about him and two true friends; we also feel his immense insecurity and loneliness. D had so little and lost so much that he couldn’t realize his own blessings. There was something in him, though, something from his mother that never allowed him to give up on himself or others. His pain makes him doubtful in his relationships but his upbringing demands him to be thoughtful and giving. It’s this depth of character that brought Nuru, the bird creature to him so that D could work with her to save the lost souls in the netherworld. It’s D’s intelligence in math that brings him his new friend, Hakeem, ‘Keem’, the basketball star who needs help in math. While working together, the meet Nyla, an elusive and carefree soul in whom Keem has a bit of an interest. Keem and Nyla prove to be true friends to D as they fight save D from the creatures below. Dmitri’s entire world is turned on its ear when, at eleven, his mother loses her battle with breast cancer. Because he’s being shuffled between foster care and his new home, starting a new school, and finding new friends, he’s more than just a little off kilter, to say the least. So, he shouldn’t be too surprised when the injured bird he rescues from the park turns out to be anything but a bird, right? Dmitri, or D as he comes to be called, is an example of entirely too many kids in this day and age. He’s being raised by his mother and has no idea who his father is. When his mother dies, he’s on his own. Left without any family, he becomes a ward of the state, but he’s okay with that. He’s even okay with the idea of being fostered by an elderly white woman, as odd as it seems at the time. His easy manner and ability to adapt to the situation are what guide him along in his quest to help Nuru, the otherworldly being he found in the park, ferry lost souls to their final resting place. He’s a good kid who’s had a bit of bad luck, but makes it work for him as best as he can. It was nice to see a story about a misfit who not only finds his fit, but also his purpose. D takes his passion for math and bird watching and embraces them, giving himself some kind of focus in his out-of-focus world. Ship of Souls is a different sort of story sure to catch your attention and hold it tight. An entertaining novel that's good for any age. Its inventive storyline and charming band of misfit characters will intrigue you. It’ll also help reassure you that no matter how lost you’ve become, there will be someone there waiting to help you find your way home. It may be in the form of a friend or an otherworldly being like Nuru, but you will find your guide. The fact that the protagonist, D, is a math whiz caught my mathematical eye and drew me to this intriguing children’s book. But no, you don’t need to be a mathematician to enjoy it. Having some small sympathy for kids who feel like outcasts will help of course, but then, what kid doesn’t feel that way sometimes. And, as this story tells, even the popular kids can be outcasts of a sort. All of which Ship of Souls a pleasingly different story for young teens. D is a foster child who tries too hard The fact that the protagonist, D, is a math whiz caught my mathematical eye and drew me to this intriguing children’s book. But no, you don’t need to be a mathematician to enjoy it. Having some small sympathy for kids who feel like outcasts will help of course, but then, what kid doesn’t feel that way sometimes. And, as this story tells, even the popular kids can be outcasts of a sort. All of which Ship of Souls a pleasingly different story for young teens. D is a foster child who tries too hard to be perfect, Hakeem is a Muslim basket-ball player, beloved for his skills but never quite trusted for his faith, and Nyla is the natural beauty and great leader they both long to talk to. In Ship of Souls, birdwatcher D meets a mysterious un-bird and the team of teens is led to discover strange secrets under lower Manhattan. But D is discovering truths about himself too, and even the child who feels totally separate might find himself bound by friendship and common goodness. The history of Manhattan, from Revolution to African Burial Ground and beyond, feeds nicely into this tale, with hints of spirituality, very practical details of adventure, and a touch of science fiction mystery. Lost souls of various sorts find home while others refuse to recognize “the war is over.” Meanwhile D learns that home’s not just a place. The writing is detailed, told in first person present tense, and the story’s relatively short, equally balanced between a modern-day Brooklyn school and the realms of fantasy. For myself I’d have liked more background in the fantasy, but I’m sure that’s just me. Ship of Souls is a pleasing tale with good characters, an intriguing touch of history and fantasy, and a wise lesson for young readers. Disclosure: I received a free advanced readers’ copy of this novel in exchange for my honest review. I'm primed to like any book that begins with an author essay about the magic she sees in the world around her and the little synchronicities that inspire connections that might not otherwise be made. I'm a person who gets up every day looking for the magic, no matter how small it might be. Magic's always there and it's a universally great reason to get out of bed when compared with all the other more mundane reasons. It also helps me keep my mind open and stay in the moment rather than spending I'm primed to like any book that begins with an author essay about the magic she sees in the world around her and the little synchronicities that inspire connections that might not otherwise be made. I'm a person who gets up every day looking for the magic, no matter how small it might be. Magic's always there and it's a universally great reason to get out of bed when compared with all the other more mundane reasons. It also helps me keep my mind open and stay in the moment rather than spending my days shut off from the best parts of the world. Ship of Souls is a middle-grade book (ages 11 and up) about the difficulty of being an outsider kid (or group of kids). D is in the foster care system having lost his single mother and only family. He is fortunate to have two friends, Hakeem and Nyla. Hakeem is a star basketball player who is always under suspicion because of his Muslim religion. Nyla is the self-appointed head of the "freaks" who band together to stave off the rest of the kids and their contempt. When these three children find each other, magic begins to occur. Loved the demon bird cover, book was kind of meh. 11/12yo "D" (no one except his mom calls him Dimitri) has had some struggles. Dad is a mysterious, non-existent figure from his past. Mom has recently passed away from breast cancer. D spends a brief time in the foster care system before being taken to live with kindly old Mrs. Martin. But then the crack-addicted baby foster girl comes to live with them and D feels a little overwhelmed. He's just getting into his new school and is accelerating in Loved the demon bird cover, book was kind of meh. 11/12yo "D" (no one except his mom calls him Dimitri) has had some struggles. Dad is a mysterious, non-existent figure from his past. Mom has recently passed away from breast cancer. D spends a brief time in the foster care system before being taken to live with kindly old Mrs. Martin. But then the crack-addicted baby foster girl comes to live with them and D feels a little overwhelmed. He's just getting into his new school and is accelerating in math, has made a friend of an older boy named Keem that needs a math tutor, and there's an awkward friendship with Keem's crush Nyla. (Both Keem and Nyla seems older than what I guess are 8th grade in the story). Anyway, then D finds a possessed bird who wants him to be a "host" for her spirit and go down under Prospect Park in NY to find the souls from the African Burial Ground and help them move on to the next realm. There's a LOT that's left unexplained, and everything moves too quickly to be satisfying for my taste. I think if this story had been fleshed out more it would have been much better. In New York City, a pre-teen boy named Dmitri loses his mother to cancer, and without any other family, finds himself in foster care. His foster mother seems caring, but she is also parenting a crack-addicted baby, so her attention is divided. In school, “D” meets a Muslim basketball star Keem when he is asked to tutor him in math. Both boys are enchanted by a young girl, Nyla, who has numerous piercings and an attitude. These three African-American pre-teens connect and form an odd pack when they In New York City, a pre-teen boy named Dmitri loses his mother to cancer, and without any other family, finds himself in foster care. His foster mother seems caring, but she is also parenting a crack-addicted baby, so her attention is divided. These three African-American pre-teens connect and form an odd pack when they decide to go to the park with D, who enjoys bird watching. A strange bird that talks and shape shifts appears to D one day, and from that day forward, nothing is the same. What quest is D following with the bird as his guide? Why do Keem and Nyla decide to participate? When the three end up underground with an even stranger assortment of “characters,” what will eventually bring them back to their world? I don't usually read young adult books, but decided to take a chance when offered the book by the publisher. Ship of Souls is a short book, only 120 pages in print. The author starts with a good premise. We are introduced to D, aka Dmitri, an 11 year-old boy who has recently lost his mother to cancer, been placed in foster care and starts a new school. D is a good kid, polite to his elders and a math whiz. When he is asked to tutor the school's top basketball player, he meets Keem and then Nyla, I don't usually read young adult books, but decided to take a chance when offered the book by the publisher. Ship of Souls is a short book, only 120 pages in print. The author starts with a good premise. We are introduced to D, aka Dmitri, an 11 year-old boy who has recently lost his mother to cancer, been placed in foster care and starts a new school. D is a good kid, polite to his elders and a math whiz. When he is asked to tutor the school's top basketball player, he meets Keem and then Nyla, a tough young girl with loads of self-confidence. The three of them quickly form a friendship. That friendship is tested when D is chosen as a host for a strange bird with an agenda. This is a fantasy novel set in New York. D is a foster child having lost his mum to cancer, and never knowing his dad. One day he discovers a magic bird that needs him to help her save the lost souls of many dead people who have been prevented from making the final journey on the "ship of souls". For me I was alright with the beginning of this book which introduced the back-story, D, his friends and his family circumstances, but then the fantasy elements came in and I was a little unconvinced by This is a fantasy novel set in New York. D is a foster child having lost his mum to cancer, and never knowing his dad. One day he discovers a magic bird that needs him to help her save the lost souls of many dead people who have been prevented from making the final journey on the "ship of souls". For me I was alright with the beginning of this book which introduced the back-story, D, his friends and his family circumstances, but then the fantasy elements came in and I was a little unconvinced by it all. Maybe that was because the magic bird was such a weak character (in my eyes at least) lacking a clear mission and a clear identity. Also D at the end of the book decides he has nothing to live for which was surprising given the promising life it looked like he had ahead of him, so I was unconvinced by that too. Perhaps if the book was fleshed out it would have been better, so D's life would have looked worse and the danger parts could have been more suspenseful. As it was those parts were over in an instant. Reading the blurb suggests there is a lot going on but the full story is squashed into not far past 100 pages. Ship of Souls is an emotionally charged novel that blends the genres of fiction, historical non-fiction, and fantasy. In dealing with real world issues such as cancer, adoption, bullying, racism, drugs, and poverty, this novel not only tugs at the reader’s heart strings but it interweaves many complex issues that children must face on a daily basis. Without sugarcoating the issues, Ship of Souls presents a very down-to-Earth story that is sincere in its believability. The uniqueness of the trio Ship of Souls is an emotionally charged novel that blends the genres of fiction, historical non-fiction, and fantasy. In dealing with real world issues such as cancer, adoption, bullying, racism, drugs, and poverty, this novel not only tugs at the reader’s heart strings but it interweaves many complex issues that children must face on a daily basis. Without sugarcoating the issues, Ship of Souls presents a very down-to-Earth story that is sincere in its believability. The uniqueness of the trio of D, Keem, and Nyla, for their wide ranging personalities and beliefs, has seldom been seen in young adult texts that I have read and is utterly refreshing. Unlike the human characters, Nuru, the magical bird from another realm, brings with her a disjointed tale of the afterlife. Historical notes dot the latter half of the novel which makes for surprisingly interesting details. The novel’s pacing is relaxed and offers a speedy read, especially once D encounters Nuru. Ship of Souls certainly appeals to many different readers across all populations and categories. Zetta Elliott created a wonderful read that carries readers into a world filed with magic and history. Ship of Souls takes place in New York and follows the life of a boy named Dmitri, otherwise known as “D”, who is in and out of foster care due to the sudden loss of his mother. D is a bright student who excels in mathematics and befriends a basketball player named Keem and a unique girl with piercings named Nyla. While walking in the park one day, D finds an injured bird, named Nuru, who speaks Zetta Elliott created a wonderful read that carries readers into a world filed with magic and history. Ship of Souls takes place in New York and follows the life of a boy named Dmitri, otherwise known as “D”, who is in and out of foster care due to the sudden loss of his mother. D is a bright student who excels in mathematics and befriends a basketball player named Keem and a unique girl with piercings named Nyla. While walking in the park one day, D finds an injured bird, named Nuru, who speaks to him and asks for his help to unleash souls of the dead so that she can guide them back to her realm. At first, I didn’t think that I would enjoy the book because of the fantasy that it contains, but I loved the book and wasn’t able to put it down. I loved how Zetta Elliott tied in the Revolutionary War with her book. Some of the history that was presented in the book was information that I had never heard of. I received this book as a gift from my college professor and I really enjoyed the book. I look forward to reading more books by Zetta Elliott. Ship of Souls fully explores the theme of belonging. This urban fantasy is a must-read for anyone looking for his or her place in the world. Thoughtfully written, the first-person text takes the reader through a mystical world woven into our own. Elliott also cleverly intersperses history from the American Revolution and contemporary issues of labeling and terrorism. The elements of the text that have nothing to do with the fantasy world have an honest quality about them that will likely resonat Ship of Souls fully explores the theme of belonging. This urban fantasy is a must-read for anyone looking for his or her place in the world. Thoughtfully written, the first-person text takes the reader through a mystical world woven into our own. Elliott also cleverly intersperses history from the American Revolution and contemporary issues of labeling and terrorism. The elements of the text that have nothing to do with the fantasy world have an honest quality about them that will likely resonate with many readers. When D's only parent, his mother, dies of cancer he is left alone in the world but is fostered by elderly Mrs Martin. However, his temporary haven is shattered by Mrs Martin taking in baby Mercy, born as addicted to crack cocaine as her mother and screaming in withdrawal. And he has been tasked at school to tutor the intimidating basketball jock Hakeem. As D escapes to the nearby park he believes he's finally lost his mind, a bird is speaking to him. But this is no mental breakdown, it is the em When D's only parent, his mother, dies of cancer he is left alone in the world but is fostered by elderly Mrs Martin. However, his temporary haven is shattered by Mrs Martin taking in baby Mercy, born as addicted to crack cocaine as her mother and screaming in withdrawal. And he has been tasked at school to tutor the intimidating basketball jock Hakeem. As D escapes to the nearby park he believes he's finally lost his mind, a bird is speaking to him. But this is no mental breakdown, it is the emergence of a strange and wonderful story, of the restless souls of the African Americans that built Manhattan and how the history of New York lies only just below the surface.